The Reserve Bank of India recently announced the introduction of a never-seen-before Rs 200 currency note and said that it would simplify getting change for larger-denomination notes. The Rs 200 note will be the first newly-introduced denomination since the introduction of Rs 2,000 notes in November last year, when the government decided to demonetise and recall the old Rs 500 and Rs 1,000 currency notes. Why was it so important to have a 200-rupee note and how are currency denominations determined in the first place? The RBI said that among all available denominations, these new bright yellow-coloured 200-rupee notes are the missing link in the Renard Series, a series of preferred numbers first proposed by French army engineer Charles Renard. In order to determine currency denominations, the central bank follows a variation of the Renard Series, called the 1-2-5 series, in which a ‘decade’ or a 1:10 ratio is covered in 3 steps. The first number in the series would be 1, the second would be 2, and the third would be 5. When extended, it would read 1,2,5,10,20,50,100,200,500,1000,…etc. As you can see, the numbers in the 1-2-5 series are very conveniently arranged to simplify transacting. So if a person has a 10-rupee note and wishes to buy something worth Rs 3, he would be able to get his change in the form of a 5-rupee note or coin and a 2-rupee coin, instead of getting seven 1-rupee coins or three 2-rupee coins and a 1-rupee coin if the currency had not been denominated that way. 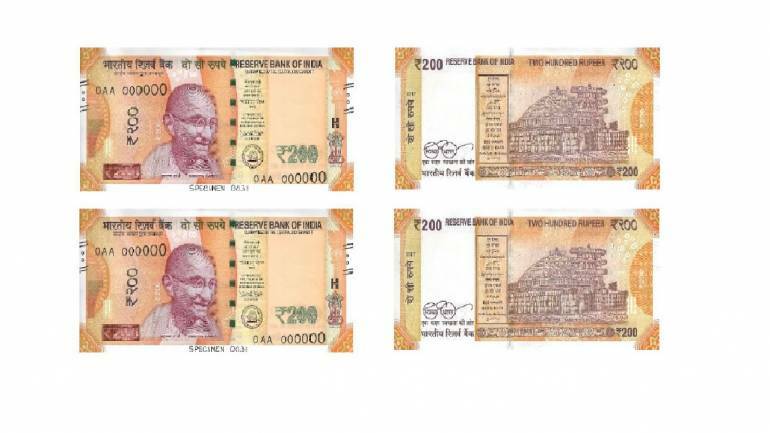 Since India already had 1-rupee, 2-rupee, 5-rupee, 10-rupee, 20-rupee, 50-rupee, 100-rupee, and 500-rupee denominations, the 200-rupee note was added to complete the 100-200-500 part of the series. Furthermore, there have been reports suggesting that the government is also in the process of printing new Rs 1,000 notes, which along with the Rs 2,000 note launched last year, will form two thirds of the 1000-2000-5000 part of the series. Incidentally, India is not the only country that follows the 1-2-5 series to denominate currency. The euro and the British pound are two of the most notable currencies that are denominated in the 1-2-5 series.